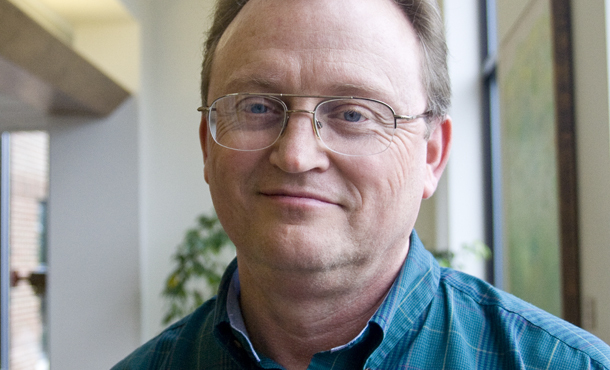 Mark Thiessen Nation, professor of theology at Eastern Mennonite Seminary, has broken new ground in the story of Dietrich Bonhoeffer. Nation’s new book, co-written with two former students, argues that Bonhoeffer was a pacifist from the time of his tenure in America in about 1931. Going against the conventional wisdom that Bonhoeffer was a co-conspirator in one or more plots to kill Hitler, Nation et al assert that Bonhoeffer was and remained a Christian pacifist, committed to the “costly discipleship” of which he wrote so powerfully. As a fan of Bonhoeffer’s I was always troubled by his alleged involvement in the unsuccessful attempt to assassinate Hitler, which seemed at odds with his complete commitment to the Christ of the Sermon on the Mount. One of the classic lines of Christian literature is Bonhoeffer’s “When Christ calls a man, he bids him come and die” from The Cost of Discipleship, now re-titled in a new Bonhoeffer edition as just Discipleship. Now there is strong evidence that Bonhoeffer was executed, not for his attempt to kill Hitler, but for his unswerving commitment to Christ and his consistent pacifism. If true, and I hope it will attract further examination, Bonhoeffer emerges as a true martyr for Christ, not just another Christian who resorted to violence to combat evil. Nation presented the results of the team’s research at a colloquium at EMU. You can listen to the podcast, which runs about an hour, plus 20+ minutes for questions from the audience. You can also download the podcast from EMU’s iTunes selections. Nation’s case is well-made, with compelling stories and illustrations from Bonhoeffer’s life. The podcast is worth an hour. The book will be published by Baker Academic some time next year. 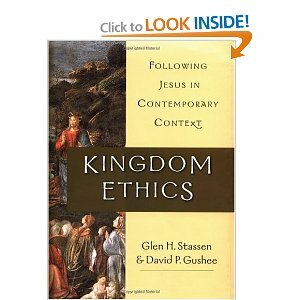 Kingdom Ethics: Following Jesus in Contemporary Context by Glen H. Stassen and David P. Gushee. InterVarsity Press, 2003. 491 pages. In Kingdom Ethics, Glen Stassen (Fuller Seminary) and David Gushee (McAfee School of Theology) provide a Christian ethic rooted in the idea of the Kingdom of God as defined by Jesus’ teaching in the Sermon on the Mount. But this is not a typical treatment of either. Perhaps the most helpful aspect of their Kingdom perspective is the section on the “Transforming Initiatives of the Sermon on the Mount.” The authors present the commonly held views of The Sermon on the Mount, but then move to give new meaning to the Sermon and its application through a new look at the construction of each teaching section. My post, Is Feb 3 Really Super Bowl Sunday?, has been viewed 1,263 times since I posted it on January 22. We’re obviously interested in the Super Bowl and how our churches can be effective on that day. My point was that for followers of Christ, Sunday does not belong to the NFL, it belongs to Christ and His church. On Sunday morning in Chatham, we’re celebrating Transfiguration Sunday, not Super Bowl Sunday. Helping others find the rhythm of God’s grace in their lives is the mission of the church, in my opinion. If we can lead others to pattern their lives with a consciousness of God’s work in God’s world, we go a long way toward helping people grow in their relationship to God. Several years ago, I heard a preacher say, “You can tell what priorities people have by looking at two things — their calendars and their checkbooks.” I think he was right, and the way we not only plan our time, but understand the meaning of time is important for followers of Christ. So, that’s why I like the Christian Year as a framework for church worship and planning. And, that’s why I preach from the revised common lectionary. And, that’s why Debbie and I follow the practice of “keeping the hours” by praying the daily office each day. Those rhythms govern our lives and remind us that we do indeed live in sacred time. The Old Testament examples of yearly festivals (Feast of Tabernacles, Passover, Pentecost, etc), and the 3-times daily prayer of people like Daniel are biblical examples of what I’m talking about. These practices were long ago reinvented for the Christian church in the form of the Christian Year, the daily office, and recommended scripture readings. Churches of all sizes — ours is small with about 80-100 each Sunday — can do the very things I am suggesting and bring a new awareness to their members. We’re doing it here in Chatham in a 151-year old congregation that has embraced positively the Christian Year, the lectionary, and my references to the daily office. What’s your experience? How is your church shaping the lives of your members each week, month, and year? Others are interested in this issue, and I look forward to your comments and stories about how you find the rhythm of God’s grace in your life and your church. They were brand-new believers. Talk about a church planter’s dream. This was a church of new Christians. Not a transfer member among them. Newbies, to use the jargon. No preconceived ideas, no “we-did-it-this-way-at-my-other-church” notions, fresh as the new-mown hay. They participated. Okay, so maybe they participated a little too exuberantly, but they all wanted to contribute to worship. They all had a prophecy, a word of knowledge, a tongue, a revelation, or an interpretation. They obviously did not have an “order” of worship, but as Jack Nicklaus said of his golf swing, “I was going for distance and figured I could work on accuracy later.” They were going for participation first; order came later. Now, we mostly have order, but not much participation. They made mistakes, but out of enthusiasm. They did communion wrong, worship wrong, shopped in the wrong butcher shops, flaunted their spiritual gifts, tried to outdo each other in worship, and generally were the most enthusiastic church around. Paul had to temper their enthusiasm with instruction, but it’s better to have to control a fire than try to start one! They practiced their new faith while still growing in it. In the congregation there were drunks, adulterers, sexually promiscuous, those who shopped at the pagan temple meat markets, and self-promoters. Quite a congregation, but Paul never says they are not Christians. Rather, he urges them to grow in their faith by changing their bad practices. Their new faith was relevant to their world. The temple of Aphrodite, goddess of love was in Corinth, so Paul writes to them about real Christian love. The temple of Asclepius, the god of healing, was in Corinth, so it was not a stretch for them to believe that their new God was more powerful than their old god. Maybe that explains the high profile of spiritual gifts in Corinth. Whatever the reason, the Corinthians connected the dots between the pagan world in which they lived and their new found faith in Christ. They were a real church. Paul, despite all the problems of Corinth, never says they aren’t a real church. Instead, he patiently guides them into practices that are more faithful expressions of their new life in Christ. We in the 21st century church could learn a lot from the Corinthians and Paul. So, there you have it — my 6 reasons that Corinth is our best model. Because in today’s church we need to recapture some of the enthusiasm, exuberance, freshness, and mistakes of Corinth — they were alive and living their new faith!